in the SIUE School of Pharmacy (SIUE SOP) Department of Pharmacy Practice. Vogler received the award at the ICHP’s annual meeting Saturday, Sept. 16 at Drury Lane Theatre and Conference Center in Oak Brook. The President’s Award recognizes an ICHP member for contributions to the Council that are considered above and beyond the normal for a volunteer member. These contributions may be on behalf of the Council or pharmacy in general, and may be made at the local, state or national level. The ICHP President has the sole responsibility of selecting the award recipient. Hope acknowledged Vogler for her initiative to launch a pharmacy cares campaign after recognizing that the public is not always aware of what health system pharmacists and technicians do to improve patient care. Vogler encouraged members to share their own stories and write a note to their patients to let them know that they are thought of. Vogler plans to encourage student pharmacists to launch their own campaign to promote how student pharmacists impact care for patients. She has also shared her passion for patient care in ICHP presentations on such topics as the opioid crisis and transitions of care. Vogler joined the SIUE SOP faculty in 2009 and is currently serving in her second term as director of marketing affairs for ICHP. Vogler also holds a joint appointment with the SIU School of Medicine, Division of General Internal Medicine at Memorial Medical Center in Springfield. She participates in multi-disciplinary, in-patient teaching rounds with the internal medicine teams. Vogler earned a doctorate of pharmacy from Midwestern University Chicago College of Pharmacy. Her areas of interest include transitions of care, medication reconciliation, pain management, liver disease, cardiology and endocrinology. 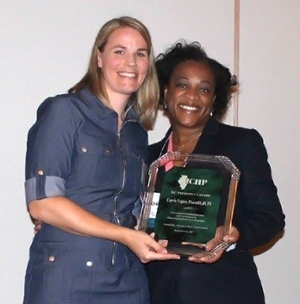 in the SIUE School of Pharmacy Department of Pharmacy Practice, receives the President’s Award from ICHP President Charlene Hope.